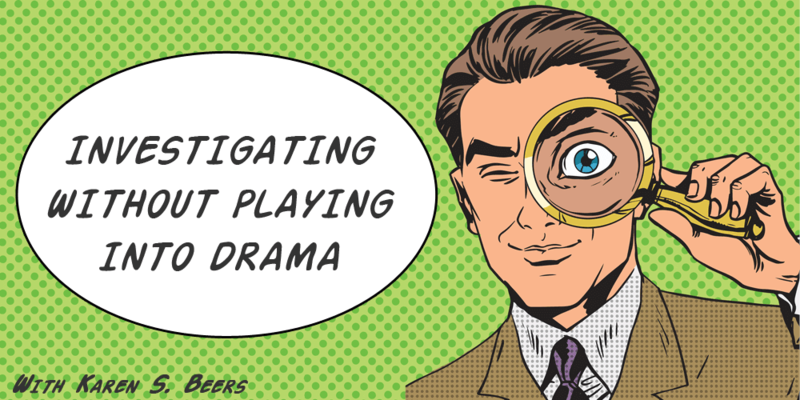 As investigators we are surrounded by different types of drama. It might be cheating drama, murder drama, suicide drama, trial drama, insurance fraud drama and the list could go on and on. You, as an investigator understand the picture. What we, as level-headed, fact finding, responsible investigators should strive for is to downplay the drama of clients and never create or feed into the drama. There isn’t much to watch on television now except drama filled reality shows, to include judges, investigators, police officers and just about any topic you want to name. Google 'reality TV' and you will be provided with numerous websites for your viewing pleasure. The players in real life drama are already drowning in so much over whelming information that they might have a hard time deciphering facts from opinions. So, we as outsiders - and if you are a hired investigator, you are an outsider - you are not part of their drama, and that is something an investigator must always remember. Even if you need to have your own silent inner mantra “It is not my drama, it is not my drama,” repeat this over and over, to yourself of course. As a professional investigator you must be able to review a case, or talk with a client about their case, without feeling the need to interject your own dramatic thoughts and ideas. Most professional investigators can speak with a client objectively and give them factual possibilities of whether a case is within the scope of their expertise to be hired. We must be able to decipher the facts and evidence in order to help the client with their specific needs - whether those needs are on a personal level or involve a court case. You never know when or where you might meet a potential client. This scenario might ring familiar to most of you: you are conversing at a casual gathering, and someone asks what you do for a living. The minute you tell them you are an investigator you get the usual, “how neat!” “I’ve always wanted to do that,” “how exciting,” “wow, just like CSI,” et cetera. Some investigators feel the need to beef up how exciting life as an investigator truly is, so they dramatize the truth. If you are a level-headed investigator, you might politely tell them it’s a job, and yes, some cases are interesting. Of course you don’t tell them that depending on the type of investigative work you do that there might be down time in the business. And if you are self-employed, that perhaps some of your “detective work” might be sitting at home, in front of your computer wearing your pajamas – that just wouldn’t be cool. Once it is known that you are an investigator, you might get several people asking you numerous questions regarding either something going on in their life, a relative of theirs, or someone they know. They will always want to give you some details of the situation they want to talk about. Notice the word “some” and expect you to give them complete answers to their situation. The best thing to do is to offer them one of your business cards and tell them to give you a call. If they are serious about possibly hiring you, they will make the call . . .The cost of the job will weed out the ones who just want to talk and talk and talk from the serious ones who truly want to find answers to their dilemma. If they are serious about possibly hiring you, they will make the call, and when you hear more about the case and ask your brief questions, then you can offer the person whether you might be able to help them with their case and then give them an idea of what it might cost. The cost of the job will weed out the ones who just want to talk and talk and talk from the serious ones who truly want to find answers to their dilemma. Always remember if you feel you do not have the expertise regarding the type of case the person has, just be honest and offer them a referral to someone who might be able to help them. This shows you are not just out to make money and truly want to help them with closure or answers. One thing we have run into over and over again is when someone will call regarding a family member who they think was murdered and the coroner has ruled it a suicide. These cases are very tough, and the families need factual answers so they can eventually work towards acceptance and be able to move on with their lives. This is what we strive for, to give the facts of the case and to answer factually all of their questions. We have people who call and ask if we can tell by looking at a photo what happened. Believe it or not that very question is also asked by professionals who know better. The appropriate answer is always no and any investigator who tells someone that they can look at a photo and tell them what happened, has no business being an investigator, unless of course that investigator saw what had happened and snapped the photograph themselves. Yes, a photograph can help answer some questions, and a photograph does “speak” to us, but it does not give all of the answers and complete an investigation. Unless you are standing there watching an event unfold, you cannot possibly give a factual scenario, and even if you are standing there watching an event unfold, you cannot get into another person’s head and know their thought processes as to why they did or did not do something to themselves or someone else. We cannot pretend to know much by hearing a few sentences or taking a gander at a photo or two. We are professionals and should act that way by not getting distracted and sucked into the drama that is happening in someone else’s life. The bottom line is, and understandably, clients are usually filled with anxiety about their case no matter what type of case they have. What they do not need is a professional investigator giving them false hope, by telling them “it sounds like a murder to me,” or any other conclusions without proper inquiry and knowledge of the facts. If an investigator is shown a photograph of a deceased person lying supine with what appears to be blood underneath their head, do not assume and then blurt out that it looks like a murder. You do not know the circumstances and facts of how that person ended up in that photo. If you tell someone it looks like a murder – you are playing into and creating more unnecessary drama. A professional investigator might tell the person who is showing the photograph that it is difficult to give an answer without knowing the details of the case however; it does look like there is trauma to the head, body or whatever the case might be. Do not ever say, “Well that looks like cold blooded murder,” and never put those words in any report - that is pure drama - and yes we have seen those words written by a professional as a conclusion. The bottom line is, and understandably, clients are usually filled with anxiety about their case no matter what type of case they have. What they do not need is a professional investigator giving them false hope, by telling them “it sounds like a murder to me,” or any other conclusions without proper inquiry and knowledge of the facts. That is wrong and certainly not professional. You might want to say along the lines of, "it sounds like some of what you are telling me should be looked into further," and offer them your expertise, or pass the case on to another investigator. It makes it very difficult to convince a client of the facts when they have had at least one other person feed into their drama. The main reason is because they have already made up their mind as to what has happened and they will continue to seek out that dramatic investigator who will eventually side with their thoughts and opinions, not the facts of the case. In one case, we were the 4th investigator hired, and thankfully we were the 4th who came up with the same factual conclusion. No doubt that person is continuing to hire investigators in hopes an investigator will eventually see things their way, dramatics versus facts. The sad reality is, if they search long enough, they will end up finding such an investigator. Hopefully that type of dramatic investigator is not a professional reading this article, and if so, please rethink how you respond to people who are in need of factual truths of their situation, and not dramatic emotional ideas. The majority of us know not to feed into drama, but there are those few who feel the need to dramatize the situation whether it be their own or someone else’s. Perhaps it makes them feel more important as they sit in front of their computer wearing pajamas.